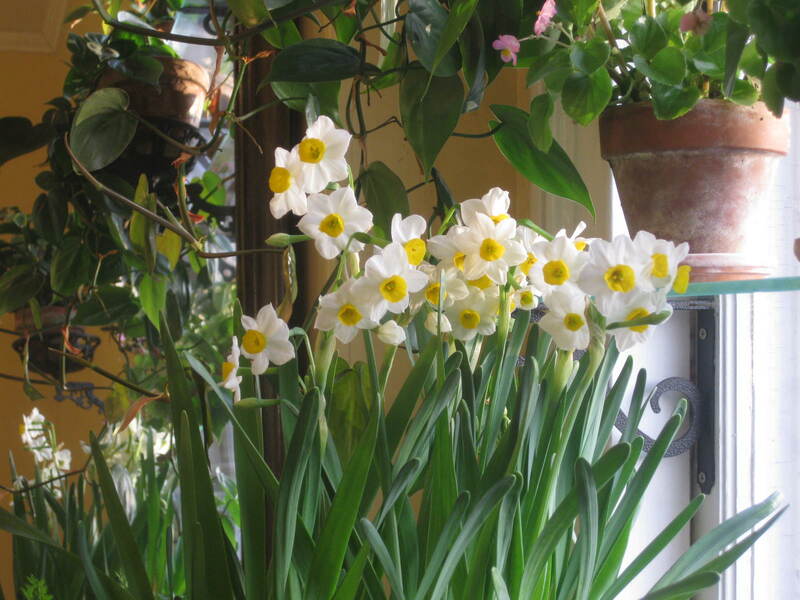 BLOOMING NOW in the east window of my upstairs bath is the fabulous “Chinese Sacred Lily,” Narcissus tazetta v. orientalis. What a welcome sight! The flowers are pure white, with a deep-tangerine cup. And the fragrance they emit — a blend of honey, clove, and citrus — is something to sing about. I’d like you to enjoy these perfumed blooms, too. And that’s why I’ve purchased a package of 10 bulbs to give away in this month’s random drawing. Like all tropical narcissi, the Chinese Sacred Lily is extremely easy to grow. You can plant the bulbs in pebbles and water, as I did, or in a pot of well-draining potting mix. Provide full sun. My bulbs took about 10 weeks to bloom, but that’s because I planted them back in October. Bulbs planted in January should bloom in 3-4 weeks time. And that means you’ll have them to enjoy for Valentine’s Day. 1. Leave a comment below. Perhaps you can tell me which flowers you are most looking forward to seeing in spring. 2. Subscribe, if you haven’t already, to my weekly email newsletter. 3. Click the “Like” button below. Enter soon! This random drawing expires on January 16 at 11:59 PM. As always, I’ll use the nifty gadget at Random (dot) org to select the winner. A bit of sunshine and spring-time pleasure. Can’t wait to look at Kathleen’s website and try her tips. I love when the narcissi and tulips (when I can keep the tulips away from the deer) come up in the spring, and the irises on the side of the house put on a beautiful show, but I most look forward to a wayward crocus that comes up near the base of our Carolina allspice. It just seems so out of place – so perfectly in place – there that it makes me smile every time I see it. I remember my parents growing these in their apt windows every winter in China, giving us the best perfume and enjoyment. i love any flower that smells like cloves!! I am looking forward to my blueberry tulips! And this year, I planted saffron crocus in a pot and they should be producing in the spring! I might actually be able to use some in a recipe! As the dreariness of winter sets in, this would be heavenly! I like your FB page and receive your newsletter. I’m looking forward to all the small early bulbs–winter aconite, snowdrops, chinodoxa, species crocus and anemone blanda. I was too busy last fall to pot up any bulbs for forcing, boo hoo. I signed up for your mailing list, is that the same as the newsletter? Thank you, Martha. Yes, that is the same as the newsletter. waiting now for the gin and watered bulbs to burst here in ohio. will welcome more for later…thanks as always for your fun gardening/cooking info. I can’t imagine anything smelling nicer than having these blooming in the middle of a dreary February. Except maybe for the smell of something chocolate and cinnamon baking in the oven…. Sign me up, Kevin! It would be lovely to win one of your giveaways! Hoping my “daffy-dills” come up again! Thanks for the opportunity to win! Love the sound of the fragrance from these guys. Paper Whites to me are pretty cloying and these sound just perfect! Racing off to check out your mousse post, ooooohhhhh! Ooh, that reminds me to get the amarylis out of the basement … I’m such a bad plant mommy. I can’t wait for my daffs to come up but I’ll take anything for some color right now. The bulb carvings are cool! would love flowers blooming in February! They are really “pre-spring” flowers, but I can’t wait for my snow drops to bloom. It means spring is on the way!! I can’t wait for the scent of Freesia. This will be their first appearance at the home I’m living in now. Bulbs give me spring fever! I love the colors and the fragrance. BEAUTIFUL FLOWERS…..the Chinese Sacred Lilies ~ I would love to win them because the Chinese New Year’s coming soon. “Gung Hey Fat Choy”, means, Happy New Year in Chinese…..(I think)! Will have to ask my Daughter in Law. She’s half Chinese / Japanese. I already have iris and daffodils peeking above the ground. I can’t wait for them to bloom! These would look lovely blooming in the garden room at Lily Hill! Love your blog!! Which flowers do I look forward to…oh my. Sadly, I don’t have a garden any longer but I do live in the Washington, DC area & so flowers galore are available for the gawking. I push friends to plant muscari because I so love them. What a wonderful Valentines Day surprise these beautiful bulbs would be ~ and low calorie too! One of my joys is seeing crocus and snowdrops peeking through the snow in Colorado in March. A great signal of all the warmth and color to come. I am most anticipating the blooms of the many tulips I planted in the fall. I love the surprise of where they emerge since I can rarely remember all the spots I put them in! I miss all the beautiful spring flowers from the north now that I live in Florida. Winning these bulbs would remind me of the beautiful spring times of the past. Thank you for the giveaway!. I love to see the crocus ,its the first sign of spring. I would love to win these bulbs, thanks! Love to see the snowdrops, tulips, and later the bearded blue Iris!! Just beautiful! I live way up north and I am looking forward to snowdrops, crocus and then the trillium that blankets the wooded hillside behinds our house. Now that winter’s finally arrived…thoughts of spring start. I look forward to seeing my daffodils, but most of all my lilacs…hoping they’re recovering from their ailment! Those photos of the carved bulbs are amazing… I think I need to find out more about that! I love my little Chionodoxa, Glory of the Snow. I have so many in bags in the basement (that are still viable, as far as I can tell) that I need to get planted! I just saved and rinsed my last milk jug to try your winter-sown seed technique. Thank you for your emails and photos, which I look forward to. It’s 1 degree here in NH, and to think of spring flowers is truly a mood lifter. I can’t wait to see the 2000 orange tulips I planted for a client come up in succession! My favorite spring bloomers are tulips. I’m trying out your winter-sown seed technique. I’m eager to see the results!! Wow, seeing these made me remember all those bulbs I planted in the fall. I went a little crazy this year with tulips and crocus and grape hyacinth, but what I really can’t wait for is my iris to come up… You do a great job Kevin! Keep up the good work and the great photos. I am trying the winter sowing technique this year all because of your site. The narcissus are beautiful! I’d love to have some bulbs. Thank you for your lovely website. I enjoy seeing the photos of your home, and the chocolate mousse recipe looks heavenly! I know nothing about bulbs, especially indoors. I am looking forward to learning how to grow such beauties! I love your newsletter and your recipes. There is snow on the ground outside. I can hardly wait for my crocus and tulips to bloom. I love all the spring flowers including, dare I say it, Dandelions and their honey fragrance. One of my favorites though is the lavender shade of Grecian Windflowers. Their happy faces turned to the afternoon sun always makes me smile. I would love to have indoor spring flowers. I usually wait for the outdoors to put on a show, but now I feel inspired to bring some of that spring show indoors. I love seeing the crocus in the spring — since they usually are the first to bloom around here. I really need some beauty in my life right now, these would fit the bill. I cannot wait until my PAPERWHITES bloom. I love the fragrance! Spring is my favorite season; can’t wait for the first bulbs to bloom (although I had some daffodils come out in mid-December…). I can already smell their honey fragrance in my living room. Thank you! After realizing the squirrels were eating tulip bulbs faster than I could plant them (sigh), I’ve stuck with varieties of daffodils. You are opening my eyes up to so many new concepts and I’m having so much fun experimenting! You may not realize it, but even seeing pictures of your flowers and sharing the transformation of your home is educational – i.e., I didn’t realize that bulbs could be so far out of the water, but your picture shows one doing beautifully. I appreciate your sharing so much. Thanks, Kevin. The person who wins the bulbs will always remember you, and have a piece of your creativity in their yard. would love to see any flowers….would mean the snow is gone and Spring Has Sprung! Sure would like to try the carving of these bulbs.Thanks for a lot of great photo’s and ideas. I am looking forward to seeing the weeping Japanese cherry tree bloom!!!! I enjoy your newsletter very much. Thanks for sharing. I always look forward to tulips and daffodils. I am an email subscriber. I also clicked the like button. I love seeing Daffodils in the spring there so very pretty. I subscribed and liked thanks for the giveaway! My favorite Spring flower is the Daffodil. It’s so cheery and happy. Love the lily too. Looking forward to seeing daffodils and tulips…can’t happen soon enough! What I most appreciate in spring are the tiny Iris reticulata, popping open impossibly early to brave the chills and dot the beds with a rich and vibrant dark purple. i love to see tulips in the spring, i am subscribed to your email and i clicked your like button too, thanks! these are beautiful. My favorites are the Tulips Every color, design and height. Each year I look forward to the crocus that were planted decades ago, that now have increased to a lovely lavender & purple blanket encompassing an equally amazing Japanese maple. It always makes me pause & smile with relief that winter’s on it’s way out and that Spring is on it’s way with all the magnificent flowers, shrubs & trees busting into bloom~ like pastel fireworks! These Chinese daffs would be welcomed on the kitchen windowsill with their beauty and sweet & spicy scent! I thoroughly enjoy your newsletters, ‘touring’ your 1800’s home, and will make homemade mozzarella thanks to your article! 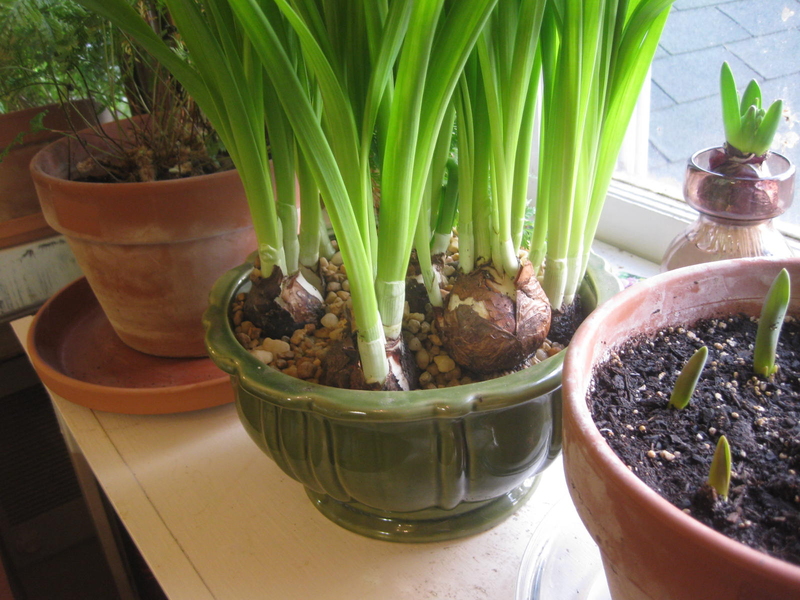 I am looking forward to my new pink tulip bulbs and paper whites to bloom this spring. The Chinese Sacred Lily would be a welcomed addition. I enjoy receiving your e-mails and visiting your page! Can’t wait to share this with my friends. The narcissus is my favorite. The earliest fragrant one in my yard. winter has come hard in Michigan This would be a true lift…. Hey there Kevin! I am a plant whore-der. I don’t discriminate. I look forward to any color the spring ushers in from the beautiful bulbs like tulips and daffodils to all my beautiful Texas wildflowers such as Indian blanket flower to our lovely state flower The Texas Bluebonnet. So glad to have found your website – such an inspiration! I always look forward to tulips and hyacinth in the spring. This lily would be a wonderful addition. How do I choose a favorite? When each one begins to bloom I get so excited – snowdrops, daffodils, tulips, bleeding hearts, lilacs, peonies – each for the joy they offer. What blessings they are. It is difficult to choose which flower I’m most looking forward to see this spring. However, if I had to choose, I would pick my clematis vines. They put on a show for a long period of time. I always love seeing the forsythia around the mailbox. It is a bright, bold entrance announcing spring! And I so enjoy your weekly emails! Carving bulbs, what a novel idea. Mom is the artist and I would have her try her hand at this if we were delivered these delicious bulbs! Alliums are my favorite, but then I have many favorites! I planted 300 new bulbs this fall and can’t wait to see ALL of them! I enjoy your weekly newsletter already. Thanks you. Kevin, loved your series on the tour of your home. Thank you for sharing. Do you belong to a Questers Group? I am looking for a local chapter to join here in our Detroit metro area. Love all things historical…my family came over from England in 1638 and am just starting to pursue geneology of this clan. I am looking forward to snowdrops that I brought back a long time ago from Beth Chatto’s in England and the many different types of bulbs I plant each fall in honor of my Mother’s birthday. We planted bulbs together years ago, when she was still alive and planting them each fall is my annual tribute to Nancy Day’s birthday-watching them come up in the spring brings back so many memories of our times together and mutual love of gardening. Love your website, Kevin. This week-end I started 6 milk jugs of seeds using your winter sowing technique. While outside I noticed my daffodils coming up – can’t wait. In the meantime I have paperwhites inside! These are beautiful! They’d tide me over until my daffodils came up! I look forward to whatever shoots from the ground first! Just about the time winter begins to seem it will never end, that little nib of green whatever-it-may-be peeking out of the ground to face the inconsistent temperatures head-on thrills me every time! I’m new to your site, but love it already! These daffodils are fantastic. I really need to try forcing daffs at least once. Thank you for the great pics and info. Asiatic lilies.We have a bunch in different colors all over the yard,Bright colors and good smells. I think my favorite Spring bloom is when the crocus start to pop up and I’m (reasonably) sure Spring is actually on its way. Love seeing the beautiful bulbs! Your home photos are amazing. All the love and care you have taken in the restoration is wonderful! Thanks for sharing. Peonies are my all time favorite flowers… but hyacinths are a close second…. so fragrant!!! I have a great love for all blooming things in the springtime…my grandmother taught me about bulb planting 50+years ago and I still try to add something to my collection every spring in her honor….. I love all the spring flowers..such a lovely time of year. Thanks for playing, everyone! I used http://www.Random.org to select the winner this morning. That winner has been notified by email. Stay tuned…there will be another giveaway in February (if not before). And if you’d like to continue discussing your favorite spring flowers…by all means have at it! I love little flowers that brighten up shady places. Some years the violets are really terrific — one time a few years back, on a trail in the woods, both sides of the path were covered with them. Also, we’ve had some great displays of Texas baby blue eyes at Zilker Botanical Garden (probably Nemophila phacelioides). They bloom their hearts out without a lot of sunlight. I have some similar narcissus that started blooming yesterday in my yard! I am in south MS and the daffodils are starting to open in everyone’s yards. Fun to look forward to a real spring! I love “Chinese Sacred Lily & Hyacinths.” I look forward to planting them and gazing on their glorious Flowers. I look forward to the daffodils! Next come the tulips although not all of mine seem to bloom. These Chinese Sacred Lillies look marvelous!! I realize this is an older thread. Will the “gin trick” work with Chinese Sacred Lillies? I’ve starting a pot of them and would like to keep them from getting too tall and floppy. It seems like these are close enough to other varieties of Paperwhites, but I don’t want to risk killing them. Thanks! 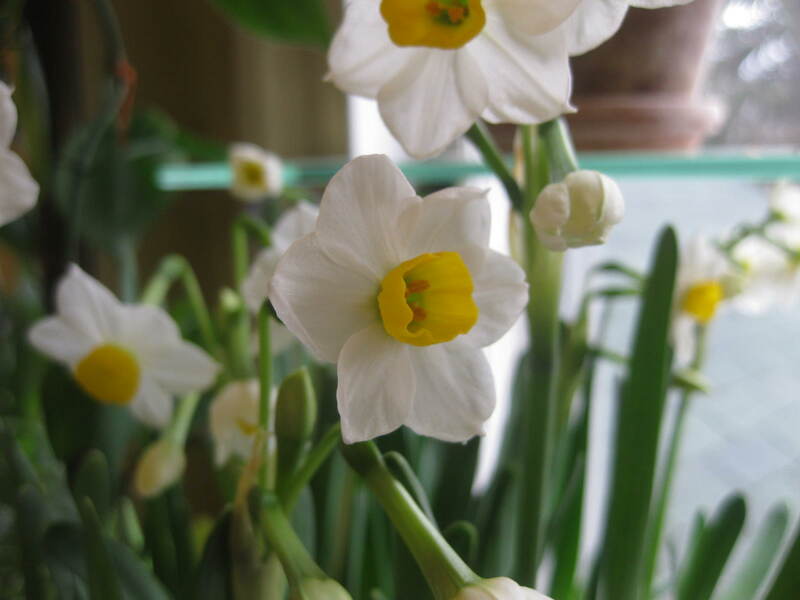 Kevin – Yesterday, in the doldrums that come with packing away Christmas decorations, I purchased a big bunch of narcissis bulbs and their very own special bottle of gin. (Well…maybe the gin won’t be JUST for my bulbs.) In years past I’ve forced narcissis only to see them topple to the desk top as they grew lanky and top-heavy. Can’t wait to see the results this year (and, if all else fails, I could make a martini) I joined your mailing list the later part of December and the pleasure you provide is enormous. Thanks so much! Glad to have found your website. Beautiful pictures of beautiful flowers. I live in Ann Arbor MI so the ability to enjoy flowers blooming indoors when it is snow covered outdoors makes me feel that much alive. Have a question about the Chinese Sacred lily. I had forced them successfully a few years ago. I bought them at the beginning of January for flowering on Chinese New Year (that year it fell on Jan. 29). I was anxious given the timing but they flowered on cue. This year, I purchased the bulbs from a different vendor based in San Diego (not sure how to store their bulbs) at the beginning of January and planted them immediately in pebbles and water. At this point, 16 days post planting, there is a lot of foliage but no sign of a flower shoot. Is this normal? The bulbs this time are smaller (but still decent sized) than previous. Just anxious for them to bloom on Feb. 10 (Chinese New Year). Would love to hear from you. 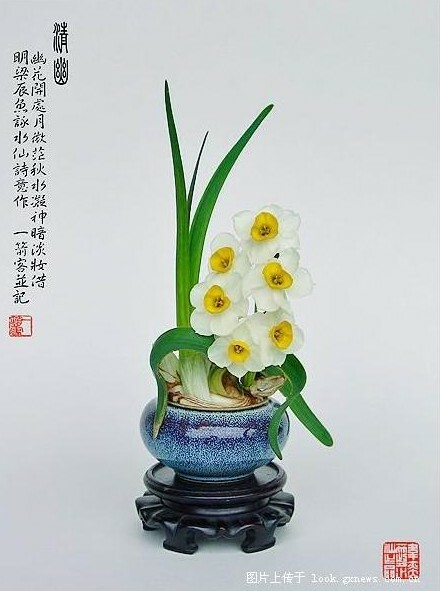 I really like your description of the Chinese Sacred Lily. The described fragrance is quite adventurous.